The new Comment Policy feature on Disqus lets you highlight the rules of your community. Not every community moderates in the same way. 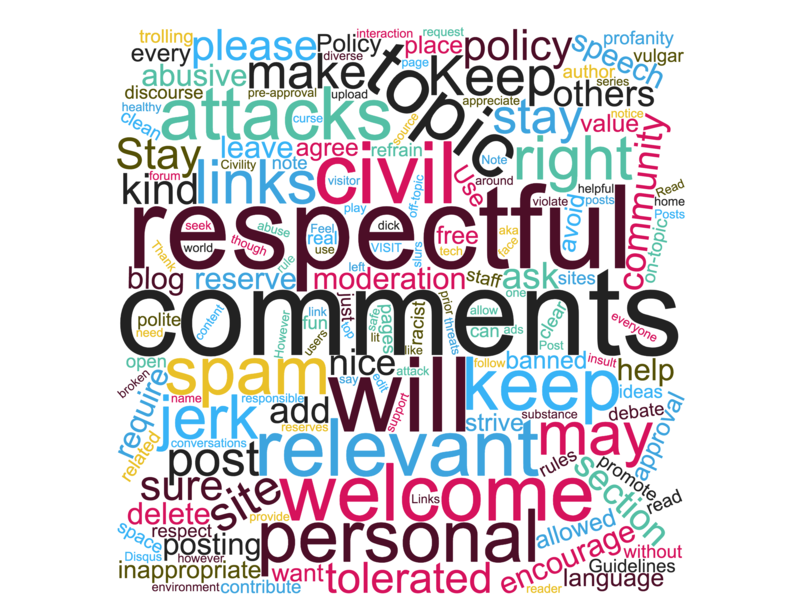 A comment that is allowed in one community may be moderated in another. Your comment policy is one way to align those expectations with your readers from the very beginning. Furthermore, posting the rules for discussion not only improves the likelihood that a comment falls within a community’s guidelines, it also increases participation overall, according to research by CivilServant. In other words, your comment policy can be a place to leverage community norms for behavior that can save publishers time with moderation. We’re excited to see that hundreds of sites have created comment policies for their communities. In this post, we wanted to share best practices for crafting an effective summary, highlight some of the best examples, and hear feedback from the community on future improvements you would like to see. Now you can see a preview of the comment policy on your site before making updates. If you haven’t created a Comment Policy yet, head over now to your Disqus Settings to set one up. Once you’re done, visit an article on your site and you’ll find your new Comment Policy directly above the comments. When creating a Comment Policy on Disqus, you have the option to create a short 1-2 sentence summary (120 characters) and include a direct link to a dedicated page containing your Comment Policy. But how do create one that your readers will actually follow? Here are some tips and best practices to help you get started. If you don’t already have one, publish a dedicated Comment Policy page on your site. Here, you can explain in detail the rules for participation, how moderation is conducted on the site, and answers to frequently asked questions. Creating a page also makes it easier for readers to find and gives you the flexibility to link directly to it. If those are questions you often hear from your readers, address them in your Comment Policy. It will save you lots of emails and tweets to respond to later. Consider sharing an update with your readers when you publish or update your Comment Policy. If you want your readers to get behind it, proactively let them know and encourage them to share feedback and ask questions. It’s important to establish the right tone that resonates with them and that they can understand. Here's a good example from A VC when they updated their comment policy for the first time in five years. The 100+ most frequently Comment Policy keywords (See high-res. image→) Created via WordClouds. Here are some of our favorite comment policies that publishers have created so far on Disqus. Don’t see yours below? Post a comment with a screenshot and we might feature yours too! Inside Higher Ed: Comments are reviewed prior to publication. Comments must contribute to the discussion; debate an opinion, not a person. Vermont Public Radio: VPR welcomes a healthy discussion of news and ideas. Please refrain from personal attacks, hate speech and profanity. MSPowerUser: We welcome relevant and respectful discussion, but rudeness and personal attacks will not be tolerated. Bulldawg Illustrated: Comment as though you were face to face. Be civil - leave out personal digs. Don't curse. Let us know how you’re using Comment Policy on Disqus. Post screenshots of your Comment Policy below and share any feedback you would like to discuss with the community in the comments below.